Overall, season two of How to Get Away with Murder has been a marked improvement on the first, streamlining storylines and developing characters and their relationships, but the biggest, thematic pull has been the mystery of who shot Annalise in the flash forwards. I had a lot of ideas. At the beginning of the season I thought it was going to be Eve, especially after Annalise giving a speech about the ones you love being the ones who hurt you. I then moved on to Nate, and then Bonnie, for similar reasons but given the added edge of both of them being wronged by Annalise. But I was wrong. While the outcome isn’t all that surprising when you think of the makeup of the show, it certainly wasn’t my first guess. Wes, is once again the one holding the smoking gun, but there’s a lot more of messy drama to wade through before the trigger pulling moment. 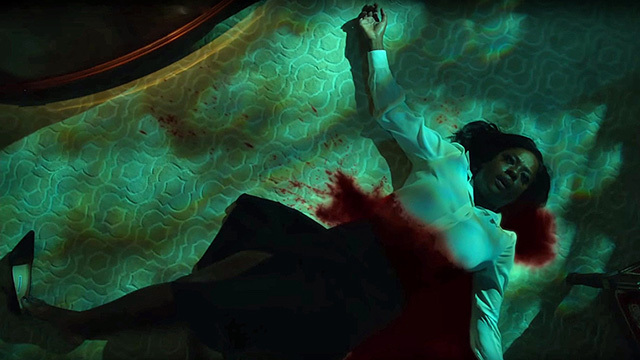 The episode is fragmented in waves of story, with the first being flared by Asher learning that his father has killed himself after a story leaked about all of the dirt Annalise had instigated. Asher, believes this is Sinclair’s doing, and spends the entirety of the episode on the verge of a nervous breakdown. Matt McGorry does some beautiful work here, especially in the scenes following being unceremoniously booted from his own house by his mother. However, the biggest shock of the night came not from Wes shooting Annalise, but when Asher backs over Sinclair in a fit of rage, killing her in the process. He calls Bonnie who comes and confirms what he was hoping wasn’t true, too shocked and afraid to look, and Bonnie begins picking up the pieces. She brings Sinclair to Caleb and Katherine’s house, to stage a crime scene orchestrated by Annalise to make it all look so chaotic so that the police won’t have a straight line to run on when they arrive. Katherine has presumably run away with Philip (which Frank is on, drugging her only to later dump her body in the woods like we saw episodes earlier), and the plan is to make it look like she shot Sinclair and then, Annalise. Once Annalise calls the police to report that she’s been shot, we know that craziness is about to ensue. We’ve seen Annalise at her wits end before, we’ve seen her do everything in her might to protect her friends and her students, but it’s here where we see her protective nature turn on those she’s been shielding up until this point. We’ve seen the Keating five feeling more trepidation this time around, with the murder of Sinclair and Annalise dumping her body in front of them to deal with being a breaking point. Annalise tells them that she, Bonnie and Frank have done so much to protect them, and that’s led to their current situation with Asher, so now it’s their turn to protect him. Still this doesn’t fly, with Connor and Micheala bailing right before dumping Sinclair’s body over the side of the building, making it look like she was pushed, and Wes refusing to help Laurel dispose of the gun, all of this leading up to Annalise’s phone call. Viola Davis’s powerful acting seems to rub off on all of the performers here, as many of them give series best turns, particularly Jack Falahee and Aja Naomi King. Annalise goes after all of them, telling them to shoot her in the leg to make it seem real and none of them agree to willingly. Annalise tells Connor that she’ll not only go after him, but she’ll go after Oliver too, telling him he’ll have a tough time in prison which makes Connor grab the gun, looking like he’ll actually kill her before Michaela jumps in front of him, begging him to not let her get inside his head, and suddenly he’s awake, realizing what he’s done and runs off disgusted. So Annalise moves to Michaela, playing on her ambition, then to Laurel, bringing up her family history and she too looks like for a second she’s going to confirm her place as Bonnie’s replacement, before realizing her self-preservation is most important. And then there’s Wes and Annalise goes all out, using their relationship and trust to dig in, finally telling him that Rebecca is dead, she’s known all along and has been dedicated to lying to him the entire time. Wes snaps, takes the gun and instead of aiming for the leg, shoots her in the stomach and looks like he’s about to kill her before Annalise begs him not to by calling him Christophe. Flashback to ten years ago, when a young Wes is being questioned after seeing his mother, believing she’s committed suicide. Then we transition to the other side of the glass, where Annalise and Eve stand and watch, Eve asking what they should do now? So what the hell is going on? Did they stage the suicide due to some case? We got a lot of answers cleared up, but plenty more just took it’s place. The confrontation scene is one of the best the shows ever done, and if this is the pace that the show will be playing with in the back half of season two, I couldn’t be more excited to see what happens next. Theories? Let me know what you think is going to happen in the comments, since clearly I’m terrible at guessing these type of things. Previous ArticleAuthor Interview: Ingrid Sundberg Talks "All We Left Behind"
Next ArticleTV Review: Reign 3x05 "In a Clearing"